Head of the Libyan Presidency Council (PC) Faiez Serraj and his rival, Head of the East-based Libyan National Army are to meet in Paris Tuesday for talks involving other Libyan factions. The meeting will be held at invitation of the new French President Emmanuel Macron. Libya has been stranded in political deadlock since the removal of the former strongman Muammar Gaddafi. UN-backed PC has been wrestling to impose its authority across the country now administrated by two governments. Haftar who sides with the eastern government has opposed the PC backed by France, US and several western countries. France also cooperates with Haftar on counterterrorism. Some French special forces died last year in Eastern Libya in a helicopter crash. The helicopter was operated by Haftar forces. French Foreign Minister, Jean-Yves Le Drian, who served as Defense Minister in Holland’s government, has been supportive of Haftar, seen as the right ally in the fight against terrorism in the North African country. 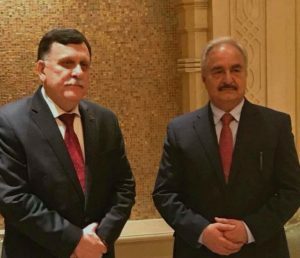 Haftar and Serraj last met in May in Abu Dhabi under the auspice of the United Arab Emirates. Written by: KanelkaTagba on July 24, 2017. Posted by KanelkaTagba on Jul 24 2017. Filed under Headlines, World News. You can follow any responses to this entry through the RSS 2.0. Both comments and pings are currently closed.